U.S. regulators are seeking a $1 million fine againstAlaska Air Group Inc. (ALK)’s Horizon Air for making more than 186,000 flights on aircraft with rivets that can damage other equipment. Horizon made the flights from Dec. 1, 2007, to June 1, 2011, before replacing the rivets on Bombardier Inc. (BBD/B) DHC-8-402 turboprop planes, the Federal Aviation Administration said today in an e-mailed statement. “We expect airlines to comply with all of our safety regulations and to correct safety defects promptly,” U.S. Transportation Secretary Ray LaHood said in the release. Horizon made 22 flights with one of the planes after being told it didn’t comply with regulations, according to the agency statement. The rivets damaged wiring on one plane, according to an Aug. 1 letter to Seattle-based Horizon from the FAA that was released by the agency. The rivets were used by Horizon to install hardened cockpit doors required to prevent terrorists from seizing control from pilots, the FAA said in its release. The airline used so-called blind rivets, which are pounded into a surface and can damage components, the agency said. The violations occurred on 22 aircraft. Airlines often contest FAA fines and end up paying less than the agency proposes. Horizon, which discovered the issue and reported it to FAA, doesn’t believe that the rivets compromised safety or the integrity of the doors, Bobbie Egan, an Alaska Air spokeswoman, said in an interview. “As soon as the FAA expressed concerns, we took immediate action to inspect the rest of our fleet,” Egan said. My Google Alerts are going crazy against AGA haha. 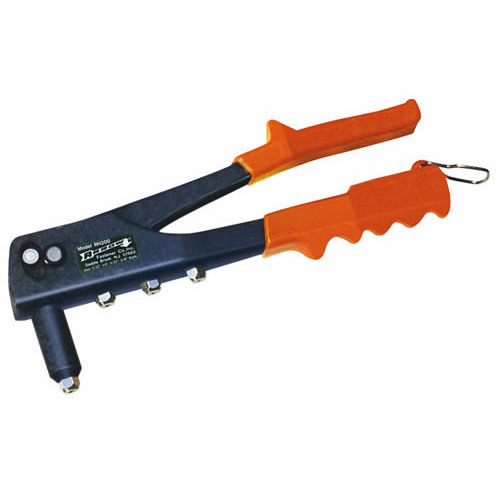 I guess electric rivet guns also exist for them (which may pound them in from outside), but I've never used one. Those lazy A&Ps. There are pneumatic pop-rivet pullers that make the job a bit easier on the paws. Probably electric ones, too. No pounding involved in a blind rivet. There are some situations where a Hand riveter just won't do the job and the pneumatic puller is necessary.